Beautiful coast survey chart showing the geology of Labrador, Canada. Sketch Showing the Geology of the Coast of Labrador. This is a beautiful 1860 map or chart showing the geology along the coast of Labrador in the Canadian province of Newfoundland and Labrador issued by the U.S. Coast Survey. The chart shows the distribution of the different types of rocks or geological formations of the region, extending from the Gulf of St. Lawrence northward to Cape Chidley and Ungava Bay. Perhaps the most interesting feature of this chart is the series of coastal views including ‘View of Mt. Bache, Aulezavik Island’, ‘View of the Crater shaped Mt. E Side of Aulezavik Island’, ‘View of high peaks between Aulezavik Sound and Ungava Bay’, View of Coast of Labrador’, ‘Mugford Island’, Entrance to Port Manvers’, and ‘View of Battle Island’. 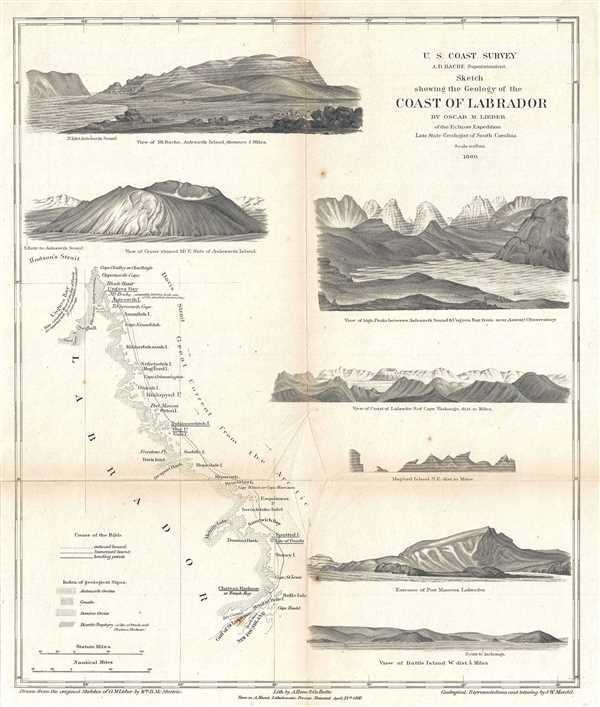 The map was drawn from original sketches of Oscar Montgomery Lieber, who accompanied the American astronomical expedition to Labrador as geologist. This map was created under the direction of A. D. Bache, Superintendent of the Survey of the Coast of the United States and one of the most influential American cartographers of the 19th century. Issued for the 1860 Superintendent's Report. Very good. Minor wear and some toning along original fold lines. Minor spotting. Minor creasing near center folds. Professionally flattened and backed with archival tissue.